Porelon fingerprint pads will take thousands of fingerprints and are always ready for use. The stored ink rises to the surface of the microreticulated thermoplastic resin pad by means of capillary action. Sm. 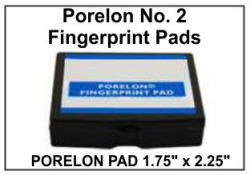 Porelon Fingerprint Pad 1-3/4" x 2-1/4"
Lrg. 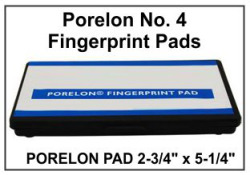 Porelon Fingerprint Pad 2-3/4" x 5-1/4"